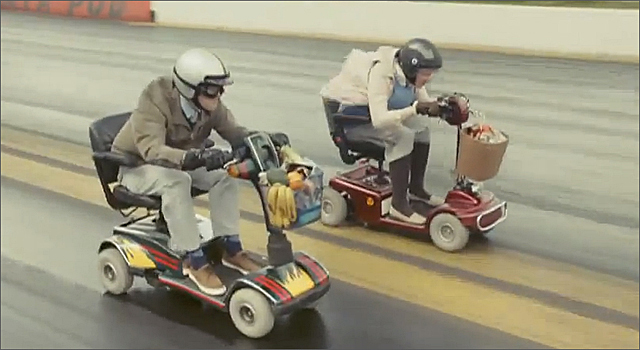 A new ad for UK gaming site JackPotJoy features two pensioners looking for new thrills by challenging each other to a drag race using their mobility scooters. I Believe in a Thing Called Love‘ by The Darkness provides the appropriate hard rick vibe to the ad. Also starring in the ad is Barbara Windsor as the Queen of Bingo. Barbara was featured in nine ‘Carry On‘ movies from 1964-1974 and as Peggy Mitchell on the BBC’s Eastenders. The ‘Just for the Jackpotjoy of it’ campaign was created by London agency Isobel.